FlowPoetry have paraded a non-stop procession of artists through the series including the likes of Glostik Willy, Ruckzuck, Alabaster, Derek Ramnarance of Old Soul Society, Earth to Clark, Low Down Sound, Gin Mill Hollow, Pine Travelers, Mudroom, Jon & Curt from Ifdakar, and Gary David & the Enthusiats, as well as poets Eric Hietpas, Jack O' Roses, and A.J. Binash. The entire series has been hosted by local favorite Spencer Houghton, who fills time with acoustic sets, band introductions, and occasional guest sit ins with Sweet Delta Dawn. The music and poetry bring people in and the family vibe of the series brings people back. 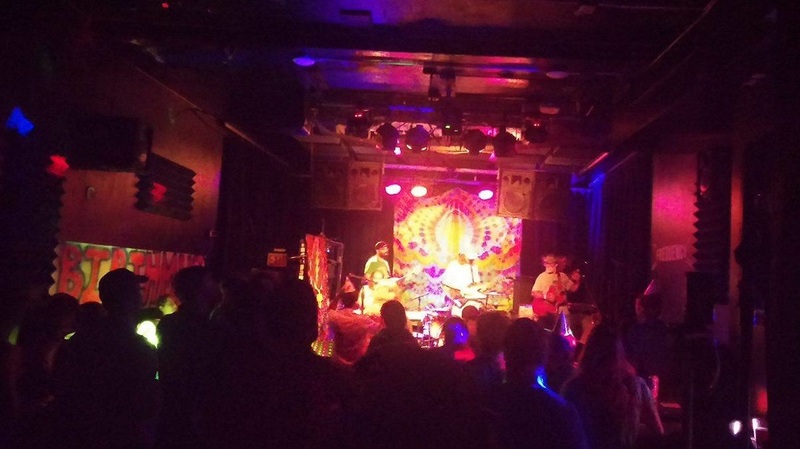 "Monday in Madison has been the night to gather with friends for as long as I can remember," says series organizer and performer FlowPoetry, "From Clyde Stubblefield to Elf Lettuce, and now the Hideout, it's great to see that tradition continue." "It's a place for heads to "hideout" and freak freely. Come along with a smile on your lips, an open heart, and get ready to spread the kindness of family and friends," he continues, "There's free hugs and enough heady music and poetry to keep your home fires burning all night. Come one come all!" Heading into tonight's anniversary celebration, the series continues their own tradition of quality, eclectic music as the psychedelic improv group Detourious will join Sweet Delta Dawn and Houghton. Detourious is comprised of Jimmy Sandborn from the local rock group The Grasshoppers, Tom Kourakis, and Paul Gorzlancyk. Also joining the fray will be a jam band super group called The Nightmen. The mysterious group is made up of Alex White, formerly of Elf Lettuce fame, and currently from Americana/jam band Pine Travelers. Additional Nightmen include White's Pine Traveler band mates Nick Clutter and Zach Brazeau. "We've had a lot of fun working up the material for this project," says White, "It's mostly a combination of original instrumentals, and outrageous covers." What covers would those be? Well, good luck getting that out of White. ​"I can't say exactly, but it mostly represents that delightfully creepy of rock and dance music from 1976-1986." ​I guess we'll just have to show up to find out for sure. ​Rounding out The Nightmen lineup is Andy Goitia of Coyote (formerly Evergreen), and Jon Schinke of Ifdakar. Schinke was the mastermind behind The Nightmen, approaching the other musicians with the opportunity. "I wanted to be a part of the One Year Celebration, musically," says Schinke, who, in his position as WIJAM co-founder, has an active role in promoting all Hippy Hideouts, "I played my first ever solo acoustic show on the Hideout stage. Curt (Schinke's Ifdakar band mate) and I played our first duo show there. It's special to me, so I wanted to bring something special to the table, and I think we have." Is this going to be a "one and done" show for The Nightmen? Time will apparently tell. ​"I'm not quite sure what we'll do moving forward," says Schinke, "We're all incredibly busy with our primary bands, and life in general, but I do know that we've all had a tremendous amount of fun getting ready, and I wouldn't rule out some more dates down the road. For now, I'm just excited for the chance to play this set, and honored for the opportunity to do so with such amazing musicians. "I've only ever been in one band before, which is Ifdakar, so it's interesting to fit into a new dynamic all of a sudden. You learn a lot about teamwork and trust being in any band, and being thrown into a completely new group really accentuates all of that. It's a learning process, for sure, just like anything. It's been a great experience." Also turning a year old is the Hideout's commitment to poetry, which is obviously spurred ​on by FlowPoetry. Fitting spoken word art into a musical dynamic is not easy, and the Hideout organizers should be commended for their commitment, and the Hideout faithful should be applauded for their maturity, and openness. Joining FlowPoetry for the celebration will be Hideout veteran poet, Jack O' Roses. ​So, as Madison's abundant history of amazing Monday nights writes another chapter this evening, in the shadow of the State Capitol, one can't help but look toward to the future. If the past is any guide, we can be well assured that the Madison faithful will support such endeavors, and if the past 12 months are any indication, we can rest easy knowing that this significant tradition is in the right hands. ​Happy birthday, Hippy Hideout! And cheers to many more!